A young professional couple from Mexico acquired an original flow-through unit in a prestigious modern building from the late 1970s. With surgical precision, carefully selected interventions transformed a compartmentalized old-fashioned apartment into a modern collage of spatial experiences, with the kitchen and bathrooms as “sanctuaries”. The composition of volumes, including furniture and built-in cabinets, fills the generous open spaces without an overwhelming presence. 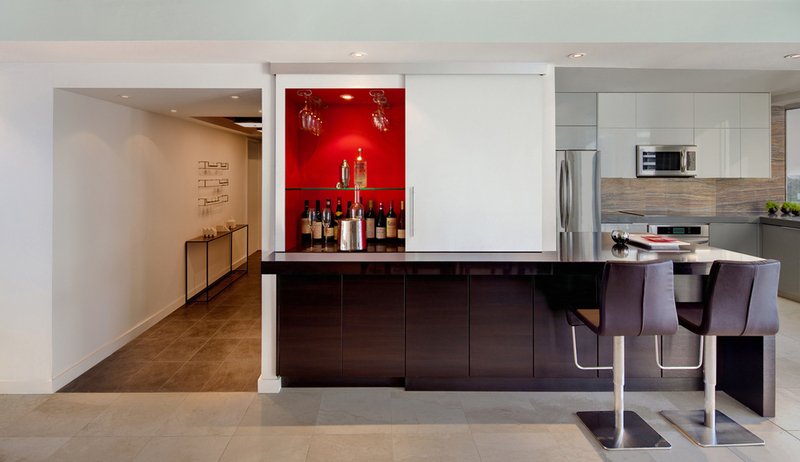 The wall and door separating the kitchen from the living room was demolished and replaced with a generous island that seamlessly wraps around into the dining room as a bar. 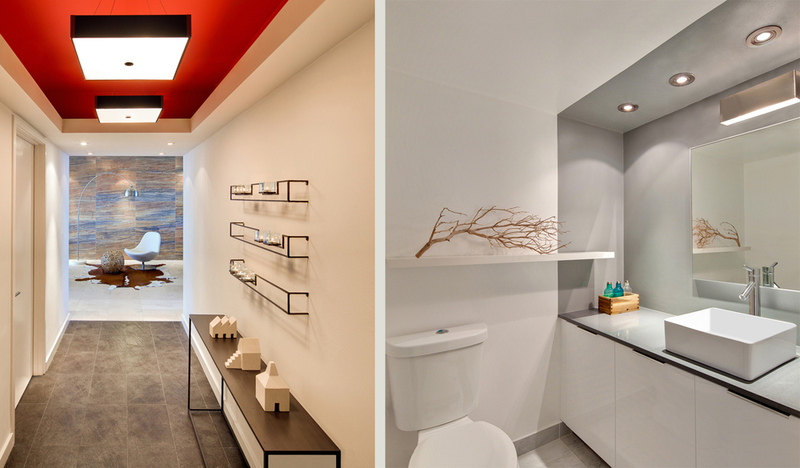 Expansive monolithic forms in contrasting colors provide a seamless transition from one space to another. The counter tops were purposefully matched to the exact color of the adjacent cabinetry to create a volumetric arrangement of forms; white for the upper cabinets, gray for the lowers, and chocolate brown for the peninsula, all combine to create the sensation of hovering complementary blocks of color. The stone backsplash incorporates all these colors and brings them together visually. Low profile furniture and cabinetry in the main living area and kitchen maximizes cross ventilation, taking advantage of the views and ocean breezes in the flow-through layout. Using colors predominant in Central America, deep earthen tones and rich dark woods are complemented with bright red accents. The visual appeal is complemented with an equally sophisticated ecological sensibility: dual-flush toilets, low VOC paint, reclaimed plumbing fixtures, recycled marble tiles, and the re-use of existing floors make an aggressive remodel gentle on our planet.